Zaha Hadid Architects director Patrik Schumacher has hit out at "superficial and ignorant" criticism of iconic buildings and star architects. In a post published on Facebook last week, Schumacher accused architecture critics of "point-scoring" by writing negatively about work by famous architects. "To criticise iconic buildings and the hype around star architects as superficial is an all-too-easy point-scoring, which usually misses the point," said Schumacher. He said that "dismissive critics" enjoyed taking a disdainful approach to work by well-known architects instead of helping readers understand it, and preferred to promote the "ordinary, obscure and underappreciated". "The denunciation of architectural icons and stars is itself superficial and ignorant," he added. He said that critics have a responsibility for communicating ideas from the profession to potential clients as well as the general public. "Rather than seeing conspicuity and success merely as a red cloth and occasion to knock down icons, it should perhaps be the task of critics to first of all explicate the reputations and inspirational works that command the attention of the discipline and the public," he said. "Explanation rather than dismissal and substitution should be seen as the critics' task." Schumacher stated that critics were ultimately responsible for creating the idea of iconic architecture and star architects, but added that these concepts were useful for helping the public engage with complicated architectural ideas. His comments come in the same week that David Chipperfield hit out at British journalists for "sensationalist" press coverage of architecture, which he said is driving "a bigger wedge between the profession and society". 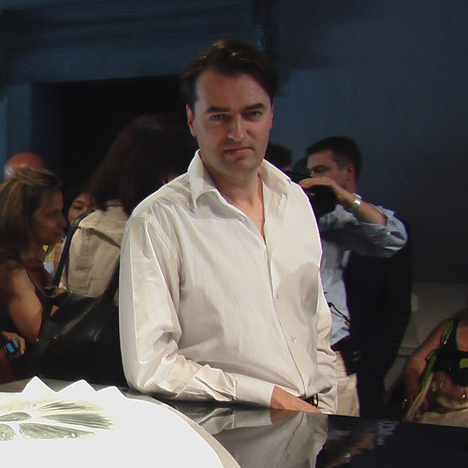 Schumacher cited British journalist and new Architecture Foundation head Ellis Woodman as an example of a "dismissive critic". In a 2009 review of Zaha Hadid's Maxxi museum in Rome, titled Roman Horror Day, Woodman said that he approached reviewing the studio's buildings with "a sense of awe for the practice's quite extraordinary formal facility, tempered by sometimes very considerable misgivings about the plausibility of the completed work". "When it has come to the crunch, I have always erred on the side of optimism but I hardly need to say that a less sympathetic observer might find much to object to in the practice's built output," wrote Woodman. Schumacher said that his firm had never aimed to create iconic buildings. "The value of our work does not depend on becoming a spectacle," he claimed. "Our buildings become icons, temporarily, until our methodology and style becomes more widespread." "The general public is often trying to make sense of these strange, abstract spatial creations by way of giving them a figural reading, as if these designs were metaphors for dragons, snakes or flames. We are always trying hard to pre-empt such figurative reading by changing the design as soon as such allusions suggest themselves. What can never be avoided, however, is that the building is misunderstood as aiming for iconicity." This is not the first time Schumacher has taken to Facebook to express his views. Earlier this year, he published a lengthy post calling for the abolition of state-funded arts schools. In 2014, he launched an attack on political correctness in architecture just before the opening of the Rem Koolhaas-curated Venice Architecture Biennale. The denunciation of architectural icons and stars is itself superficial and ignorant! To criticise iconic buildings and the hype around star-architects as superficial is an all-to-easy point-scoring, which usually misses the point. Dismissive critics – the Woodmans of this world who seem to relish the more in their condescension, the more the reputation of the object of their condescension has grown should perhaps slow down a bit in their (pre-) judgement and reflect on their role as mediators between the discourse of architecture and the interested public. Rather than seeing conspicuity and success merely as a red cloth and occasion to knock down icons (and to teach the virtues of the ordinary, obscure and underappreciated) it should perhaps be the task of critics to first of all explicate the reputations and inspirational works that command the attention of the discipline and the public. Explanation rather than dismissal and substitution should be seen as the critics’ task. In what follows I would like to indicate some heuristic principles which might guide this task of explanation. In order to make sense of iconic architecture it is helpful to begin with the distinction between the architectural discourse among architects and the discourse of architectural critics addressed to the general public. The idea of iconic architecture is a product of the critics’ discourse that plays no role in the architects’ discourse. The idea of iconic architecture serves the purpose of filling the explanatory gap that inevitably opens up because the methodology and motivation behind the unusual appearance of a radically innovative design cannot be fully explained to the general public. However, the in-depth reasoning behind these designs can indeed be explained and this is the subject of architectural discourse proper. (What needs also to be explained is that original innovations are sometimes more pointers to future possibilities - calling for a measure of strategic tolerance - rather than fully fleshed out achievements that are already in all respects fully competitive.) The mediation of aspects of this more in-depth explanation would be the critic’s task. The conspicuous, memorable visual appearance of an avant-garde design is an inevitable by-product or side-effect of the new approach taken by the avant-garde architect rather than the aim of the design effort. This is certainly the attitude we take at Zaha Hadid Architects. For instance, it is often our ambition to adapt the shape of our buildings to the complex site conditions they are meant to address. Further, we are often dealing with complex programmatic arrangements that might call for an internal intensity of relations. Our methodology involves the use of distortions, curvature and gradients, respectively in order to adapt to irregular sites, maintain legibility in the face of complex interrelations, and to articulate connections and transitions. The result is often visually surprising and stimulating. But we never aim to create an icon. Our buildings become icons, temporarily, until our methodology and style becomes more widespread. The general public is often trying to make sense of these strange, abstract spatial creations by way of giving them a figural reading, as if these designs were metaphors for dragons, snakes or flames etc. We are always trying hard to pre-empt such figurative reading by changing the design as soon as such allusions suggest themselves. What can never be avoided, however, is that the building is misunderstood as aiming for iconicity. The side-effect of innovative work, i.e. the stimulating strangeness and sometimes the figurative suggestiveness of avant-garde buildings, becomes a values in itself. Iconicity becomes a value sought after by clients. This in itself is not bad. It is indeed the only way clients intuit an innovative thrust. However, at this stage superficial epigones might enter the scene trying to exploit the taste for icons. We have witnessed some of this in Dubai and China where plentiful resources were not always matched by a sufficiently developed ability to discriminate between serious, original work and superficial spectacles. It is this phenomenon which flourished in the run up to the 2008 crash and that thereafter led many critics and architects to denounce iconicity as frivolous and wasteful. However, these dismissals should not touch us at Zaha Hadid Architects. We never aimed for superficial iconicity and the value of our work does not depend on becoming a spectacle. The star-system can be analysed and explained in parallel to the phenomenon of iconic architecture. Architectural stars are a creation of critics and the mass media. They exist for the general public rather than for the architects’ discourse. Just like radical architectural innovation translates into iconicity for the general public, in a related move, the architectural reputations gained within the discipline on the basis of innovative, influential work, eventually translate into mass media stardom for public consumption. Again this is not inherently problematic. It is inevitable that the results of the disciplinary process of reputation formation – if it should be transmitted into general knowledge at all – must go along with a certain loss of information, namely the expert information about how and why this or that preeminent reputation was gained. The star system indeed complements the idea of iconic architecture as it is the only way clients can reassure themselves against falling prey to the superficial, short-lived spectacles of the charlatan epigones. The star-system thus functions very similarly to the system of brands in general. The name of an architectural star becomes a trusted brand. It serves as a substitute for an in-depth analysis, evaluation and testing of the product. The evaluation of a large new complex building is too difficult, especially under the contemporary condition of permanent innovation. The star-system offers an alternative. This substitution is viable because the reputations the star-system is building on have emerged in a long, competitive process of peer selection. That the stardom of star architects, as it circulates in the mass media, is superficial is a necessary effect of the translation process. Complexity reduction is necessary. Only a few names become visible and as a result these names get perhaps an undue share of the overall work opportunities. Their worthiness remains unexplained, becomes a dogma. Therefore they might stay in the game perhaps a little longer than is merited, while younger talent remains obscure for longer than they should. But these inevitable shortcomings do not invalidate the essential rationality of the star-system as explicated above. Due to its inevitable superficiality, the star-system becomes an easy prey for well-informed, eloquent critics, as well as for enviously on-looking architects who feel they deserve as much attention and work as the stars and perhaps become resentful. The resultant star bashing is problematic and ultimately unproductive. The stars became stars for good reasons and they have to perform to remain on top. Like brands in general, they cannot easily be dispensed with in our increasingly complex world. They condense necessary information and thus reduce uncertainty. Iconic architecture and the star system are both creatures of the architectural critic (rather than creatures of architecture itself) who plays the role of a mediator between the expert architectural discourse on the one hand and the mass media on the other hand. They communicate relevant news from the world of architecture to potential clients, customers and the general public. But architectural stars and iconic buildings are not created ex nihilo by the critics’ Midas’ touch. The critics only distil what the expert discourse among architects and architectural theorists has already selected and confirmed through a proliferating influence within the discipline. Promoted by the mass media’s architectural critics, the star-system and iconic architecture work hand in hand, and both are here to stay as necessary mediations that convey the most important reputations and innovations to society at large. The critics have no choice but to trade in stars and icons, because their audiences need to know and they can learn what they need to know in no other way. However, the foregrounding of the underlying innovative possibilities and the (if sometimes only partial) rationality of the stars’ oeuvre could be attempted as a worthy task for the critics’ informed intelligence and eloquence. Finally, I would like to give a further hint about the potential of iconicity, without having space here to elaborate. Elsewhere I have written about the instrumentality of appearances, information-rich environments, the built environment as semiological system and about the inevitability of navigating the environment (and indeed the social world in general) on the basis of aesthetic appeal and repulsion. Iconicity plays a role in all these aspects.